South Lakes High School football alumnus Deon King has been added to the active roster of a National Football League team for the third time. The linebacker was promoted to the 53-man roster of the Cleveland Browns earlier this week. He had spent the first four weeks of the season on the team’s practice squad. 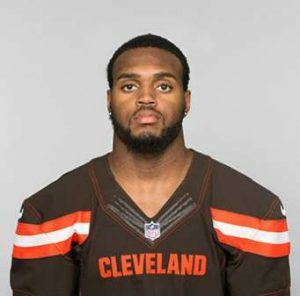 King, who signed with the Browns in June, was a member of the Dallas Cowboys during the 2016 preseason, but was released prior to the start of the regular season. He was signed by the San Diego Chargers and played in two 2016 games with them before they waived him midseason. He was added to the roster of the Indianapolis Colts, and he appeared in four more games with them that season. In his six NFL regular-season games, King has recorded two tackles. In four preseason games with the Browns this year, King recorded nine tackles (including seven solo) and a fumble recovery. According to his player profile on ClevelandBrowns.com, the 2011 SLHS graduate tallied more than 100 tackles and 10 sacks as a senior. He was also named All-District in the shotput. At Norfolk State University, King won the Buck Buchanan Award as the top defensive player at that collegiate level. He was the university’s first consensus First-Team All-America selection. King and the Browns will seek their first win of the season Sunday against the New York Jets in a 1 p.m. kickoff at FirstEnergy Stadium in Cleveland. Another recent SLHS football alumnus who played professionally is Thomas Mayo, a 2008 graduate who recorded 24 receptions for the Winnipeg Blue Bombers of the Canadian Football League last season. He was a member of the Saskatchewan Roughriders earlier this year, but was released in June.